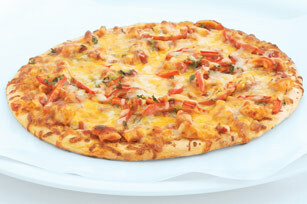 Chicken chunks cooked with salsa are layered on a crust with bell peppers, cilantro and mozzarella and cheddar cheeses for a south-of-the-border pizza. Cook chicken in large skillet sprayed with cooking spray on medium heat 10 min. or until chicken is done, stirring occasionally. Stir in salsa; simmer on medium-low heat 5 min., stirring occasionally. Spoon onto crust; top with remaining ingredients. Bake 10 to 15 min. or until cheese is melted. Substitute green pepper strips for the red pepper strips. Substitute 1 pkg. (6 oz.) OSCAR MAYER CARVING BOARD Flame Grilled Chicken Breast Strips, chopped, for the cooked fresh chicken.